In 1998, adventurer Phil Buck mounted an expedition to demonstrate the feasibility of Thor Heyerdahls' theory that Easter Island was settled by people from the west coast of South America. Heyerdahl, of course, had already shown that a raft built of balsa logs could make its way across vast stretches of the Pacific, but it had yet to be demonstrated that Easter Island in particular could be reached via pre-Columbian seagoing technology. 8 Men and a Duck : An Improbable Voyage by Reed Boat to Easter Island , by Nick Thorpe, is one of the better first-person accounts of modern raft voyaging. Thorpe met Buck by happenstance while Viracocha was still under construction in Bolivia. A reporter for a Scottish newspaper, Thorpe was really on the lookout for a personal adventure, and he joined Buck's project as crew first, and only secondarily to document it as a journalist. Thorpe's narrative is unassuming and mildly comic in tone, and his concern is far more with the personalities and interactions of the crew during the six-week voyage under crowded and uncomfortable conditions than with the technical aspects of seafaring. 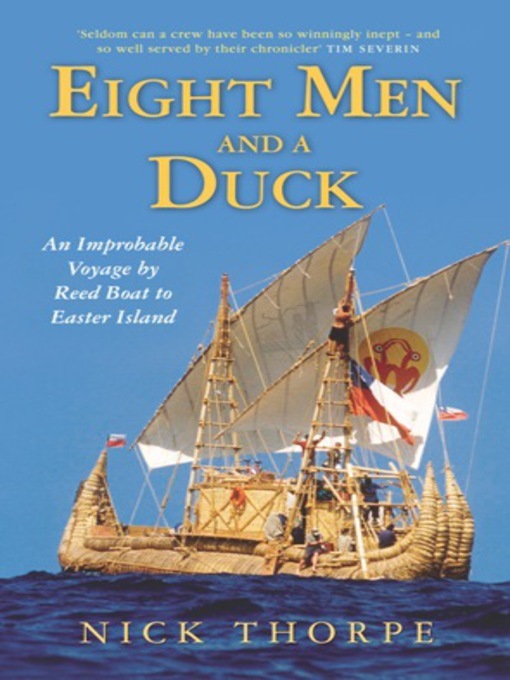 Eight Men and a Duck. One of the expedition's greatest difficulties was its opposition by another rafting adventurer, Kitin Munoz, who considered himself to be Heyerdahl's "spiritual son," and whose two previous attempts to sail reed boats across the Pacific met with failure. Munoz sniped at the Buck expedition constantly in the press, declaring it invalid due to a small amount of synthetic rope that had been used to bind some of the innermost bundles of reeds. 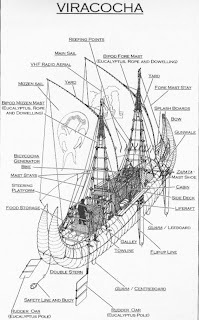 According to Thorpe, Munoz exaggerated or lied outright about several aspects of the project, and he even managed to get Heyerdahl himself to make some fairly negative comments about the Viracocha expedition in the press. Buck, who as a youth had been deeply influenced by Heyerdahl's book Kon Tiki, was deeply wounded by this criticism from his hero. In the end of Thorpe's narrative, however, he describes a meeting between himself, Buck, and Heyerdahl, some time after Viracocha's voyage. In it, Buck was able to persuade Heyerdahl of the validity of his project, gaining his approval and thus helping Buck to justify his otherwise almost entirely successful project in his own eyes. 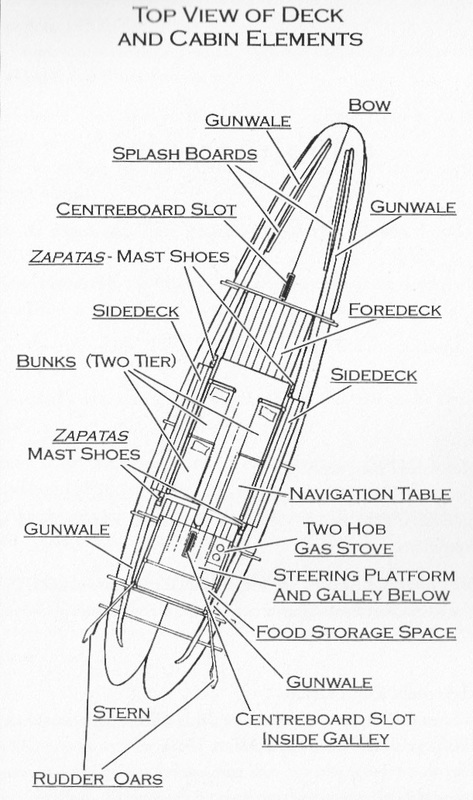 The first third of the book describes the expedition's planning and the boat's construction and launching as a narrative, while an appendix gives a good amount of detail about the boat's design and construction. 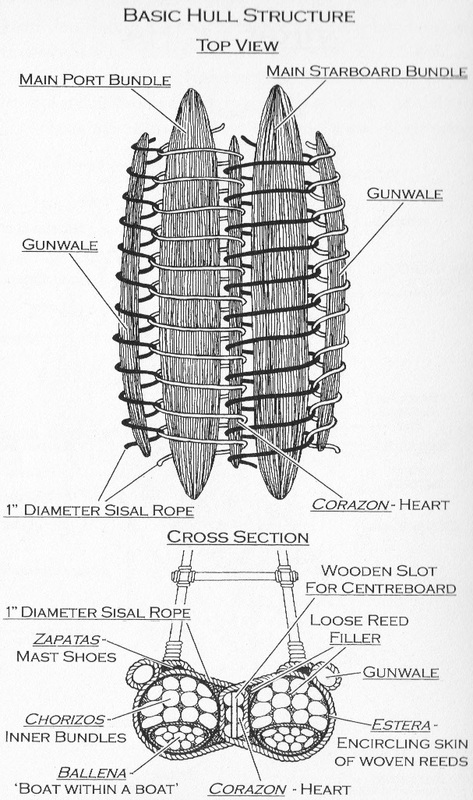 As shown below, Viracocha consisted of two main hulls of tortora reeds bound closely around a central pontoon known as the corazon ("heart"). The main bundles were somewhat blunt-ended, but to these were added extensions of more bundled reeds that tapered to points. In the front, the two end-bundles merged into a single, upturned pointed bow, while in the rear, the two end bundles remained separate, curving up into a bifurcated stern. 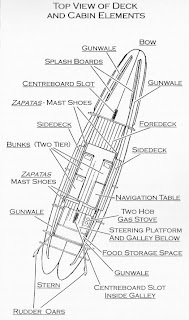 Both centerboards and leeboards ("guaras") controlled leeway, and steering was by way of a pair of steering oars with their huge blades placed entirely abaft the shafts. These, according to Thorpe, was physically challenging to manage. They obviously would have been handier had they been "balanced," -- i.e., had part of their blades ahead of the shaft. 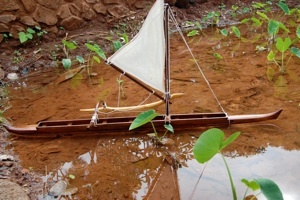 Hawaiian sailing canoe model by Jeremy Reyes. 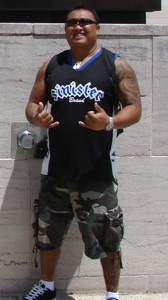 I was contacted recently by Jeremy Delos "Romes" Reyes, a Hawaiian wood carver and high school carpentry teacher whose interest in Hawaiian outrigger canoes has taken him in at least two -- possibly three -- interesting directions. Taking part in Maui's annual Festival of Canoes, he and his shop class build a full-size single-outrigger dugout canoe, as described here. At the other end of the size spectrum, Romes builds model canoes. Working at a scale of 1:12 (i.e., 1 inch = 1 foot), he builds both full models and "wall" models -- essentially a half-hull model of the main hull with an outrigger attached (maybe we should call this a 2/3-hull model?). Although the photos on his website are rather small, it appears that he does very nice work. Along with sailing canoes, Reyes seems to devote special attention to modeling racing (paddling) canoes. Looking at the arms on this fellow, it wouldn't surprise me if actual canoe racing represents a third expression of his interest in Hawaiian outrigger canoes. A couple weeks ago there was an amazing gathering of 70 or more Northwest-Indian-style canoes in LaConner, Washington. Most were true dugouts, but a few were replicas produced by other means -- fiberglass, strip-plank, etc. Some great photos in this post on the WoodenBoat Forum. (Scroll down and you'll also see a few great shots of a Maori dugout and a few other dugout oddities.) 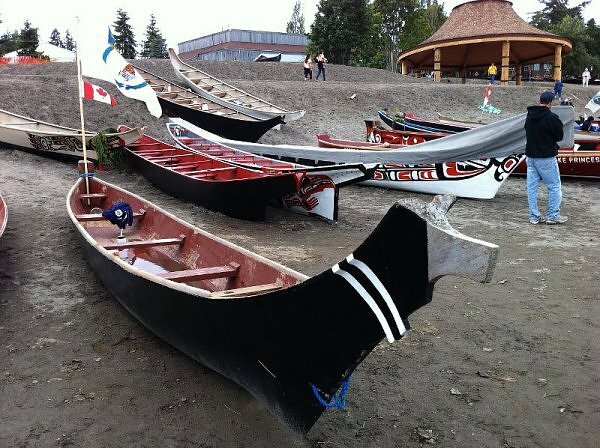 I had no idea that the native people of the US and Canadian northwest were so active in reproducing and using these beautiful boats. 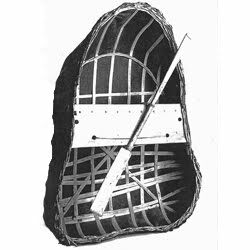 It's quite possible that the coracle was the first true boat -- certainly, it was among the earliest, for it is among the quickest and easiest to build with a minimum of very simple tools and with raw materials that are easily gathered in most regions. 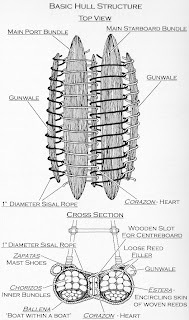 Round in plan and made from a simple framework of flexible sticks tied together, the smallest, like the bull boat of the Mandan and Lakota Indians, could be covered and made waterproof with a single hide of a large mammal. The best known coracles are those of the British Isles, where they remained in practical use until well into the 20th century. According to Lionel Casson, "Julius Caesar was the first to report seeing them there, and they are frequently mentioned by later writers. Other areas, too, found them of service, for they have also been reported in the Po Valley, along the north coast of Spain, in the Red Sea, on Lake Maeotis in the Crimea." Assyrian quffa, with four oarsmen and a load of large building stone. Note the fishermen astride inflated hide floats to the left and right. 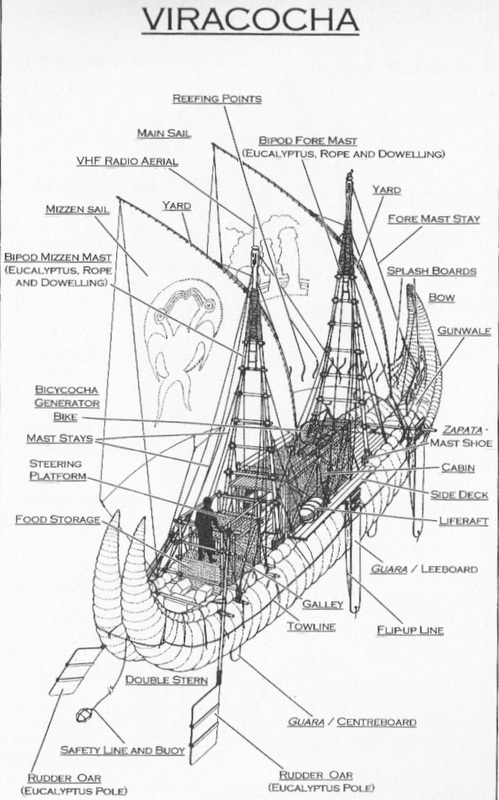 (From Lionel Casson, Ships and Seamanship in the Ancient World ) Click to enlarge image. But the coracle has an even more ancient pedigree. The quffa, a coracle of the lower Euphrates that, like the British version, was used in the 20th century, is shown on Assyrian reliefs dating as far back as the 9th century BCE. The one pictured above has four oarsmen transporting a large cargo of building stone, so it is certain that smaller, simpler versions must have predated this image by several centuries -- quite possibly by millennia. According to Casson, 20th-century quffas were as much as 13 feet in diameter and 7.5 feet deep - a veritable Hormuzmax Coracle! Later than the quffa but still ancient was the Egyptian pakton, described by Strabo (64/63 BCE – ca. 24 CE) based on direct observation. Used on the Nile, these were "originally very small craft made of woven branches; they must have been like the coracles of basket work used on the lower Euphrates, and like them must have been liberally pitched over to be made watertight," according to Casson. Later versions, made all of wood, were capable of carrying as much as 13 tons. 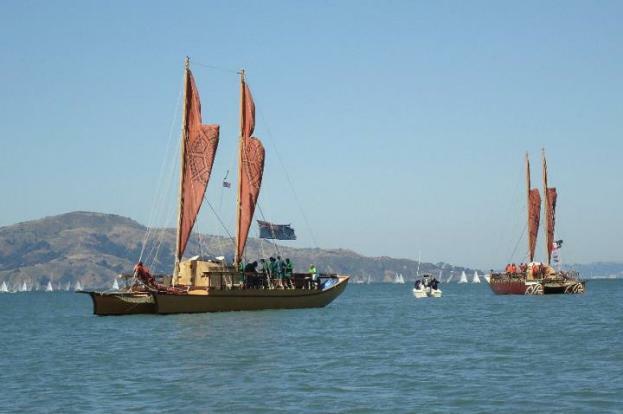 Six traditional double-hull Polynesian voyaging canoes that have been sailing around the Pacific since April entered San Francisco Bay on Tuesday. 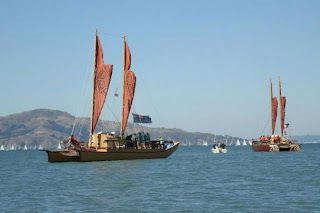 A few more details on their arrival here, and a full description of the project on the Pacific Voyagers website.